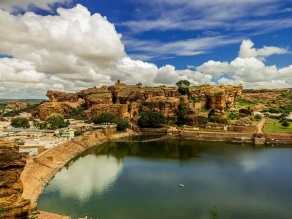 Badami is an ancient town located in northern Karnataka in the Bagalkot district. This town, known as Vatapi, was the capital of the Chalukya dynasty from the 6th to the 8th centuries. Badami served as the capital of the eastern or early Chalukyas for more than two centuries. The Chalukyan Empire covered most of Andhra Pradesh and Karnataka from the 6th to the 8th centuries. The dynasty reached its height during the reign of Pulakeshin II. After the Chalukyas, Badami lost its prominence. Situated in a ravine and surrounded by golden sandstone hills, Vatapi, as Badami was called back then, was one of the earliest places in southern India to see a frenzy of temple building activities. Badami is famous for its beautiful cave temples, which are located around the Agasthya Lake that lies at the centre of the ravine. There are four cave temples here and three of them are Hindu and one is a Jain temple. The first cave temple is dedicated to Lord Shiva. The highlight is a five-foot image of Nataraja, with 18 arms, depicting several dancing poses or mudras. This cave also has a fine carving of Mahishasura Mardini. The second cave is dedicated to Lord Vishnu. Large images of Bhoovaraha and Trivikrama adorn the east and west walls of this cave. The ceiling is covered with figures of Brahma, Vishnu, Shiva, Ananthashayana and Ashtadikpalakas. 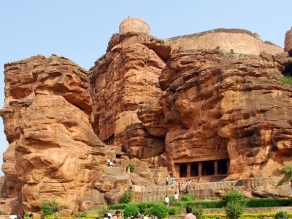 The third cave is considered to be the most magnificent display of the cave temple architecture and sculpture of this period in Badami. It has wonderfully executed figures of many Hindu gods and an inscription found here dates this temple to 578 AD. The Fourth Cave is a Jain temple. The main figures here are that of the two Jain saints, Mahavira and Parshvanatha. This temple belongs to the 12th century according to a Kannada inscription here. Beside the cave temple, there are three Shiva temples on the north hill, of which the Malegitti Shivalaya is perhaps the most famous. 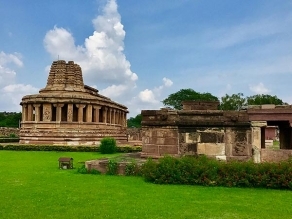 Other famous temples are the Bhutanatha Temple, the Mallikarjuna Temple and the Dattatreya Temple. Badami also has a fort that houses many temples and adventure tourists can take up rock climbing opportunities here. Badami is a fascinating place, right from its location in a sandstone ravine to its ancient cave temples and the fort. Visit Badami to see the temples and admire the skills of architects of the Chalukyan period. The ideal time to explore Badami is between the months of September and February. Badami can be reached by air, road and train. Several KSRCT (Karnataka State Road Transport Corporation) buses are available from Bijapur and Hubli. Besides, private and tourists buses are also available on a daily basis from Bangalore. Hubli Railway Station is the nearest railway station to Badami, situated at a distance of about 100 km. The station is well connected by trains from major cities of India and nearby areas. Tourists can hire rickshaws or taxis to reach Badami from here to reach the destination. Belgaum Airport is the nearest domestic airport to Badami, situated at a distance of about 150 km. Bangalore International Airport is the nearest international airport at a distance of 483 km and is well connected to major European, Asian, American and Middle East countries, besides all the major cities of India.